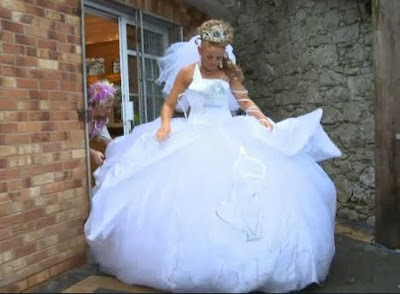 My Big Fat Gypsy Wedding is back and, according to Channel 4, it is bigger, fatter and gypsier! I have to admit, I adore this programme. It is unashamedly tacky and the girls' "more is more" attitude is contagious. After a while, I end up thinking "Maybe dressing as a pineapple for a hen do isn't such a crazy idea!" Who else would dress up as a palm tree, and dress their bridesmaid as a pineapple, for their hen night? Incorporating neons into rather exuberant bridesmaid dresses. A cat-themed wedding dress. Of course. Then, right on cue, Oscar de la Renta showcases his (quite wonderful) autumn/winter 2012-2013 ready to wear collection in New York. It is really sensational with more than a little 1960s air hostess feel about it. His showpieces include huge tulle ballgowns with a Disney princess appeal that absolute remind me of the gypsy gowns. It might seem extravagant but I do find a glimmer of inspiration in the tacky gyspy dresses. Maybe dresses too wide to fit through the doorway and my own weight in rhinestones is a bit too much for my tastes, although with a little toning down, I reckon it could work pretty well. Blue tutu. £59. Vivien of Holloway. Multi strand necklace. £25. River Island. I actually have a big petticoat upstairs. Maybe I'll give it a whirl! I'm a Big Fat Gypsy Wedding addict as well! It must be brilliant having the dress makers job and seeing all these crazy ideas come to life.